Marshall Farrer, head of Brown-Forman Global Travel Retail, has confirmed his company is “very committed” to vodka brand Finlandia following rumours of a sell-off. Speaking at the TFWA World Exhibition & Conference, currently under way in Cannes, France, Farrer admitted the brand’s performance had been “a bit of a rollercoaster” in the 2015 calendar year. He cited the tough market in Russia and Eastern Europe as the key reason behind the brand’s 3.4% volume sales declines in 2015, but added that Finlandia has an important role in terms of establishing a route-to-market for the Jack Daniel’s brand in those markets. As such Brown-Forman remains “very committed” to the vodka, he affirmed. 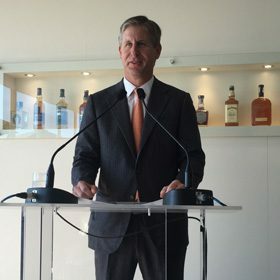 Farrer’s comments follow media reports earlier this year that the company was considering selling Finlandia in order to further streamline its whisk(e)y-focused portfolio. Brown-Forman announced it was selling its Southern Comfort and Tuaca liqueur brands to Sazerac in January 2016 for US$544 million, before snapping up Scotch producer the BenRiach Distillery Company and its trio of brands in June 2016 for US$405m. Since then, the future of both Finlandia and liqueur brand Chambord have been the subject of speculation. Responding to a question from The Spirits Business on Chambord, Farrer described the liqueur as a “niche brand” with a local market focus, but added it was “still an important brand for us”.